Aiman Nariman bt Mohd Sulaiman is attached to the Faculty of Law, and has been a faculty member since graduating from IIUM in 1993 with a First Class (Hon). She obtained her doctoral degree (SJD) on Corporate Law and Corporate Governance from Bond University, Australia in 2000. She was a key figure in the Malaysian Corporate Law Reform Programme (2004a? ?2008), firstly in proposing for a comprehensive corporate law review which led to the establishment and functioning of the Corporate Law Reform Committee and the Corporate Law Reform Project; subsequently, as a consultant for the Corporat ... show more e Law Reform Project. She was a recipient of the Australian Governmenta? ?s Endeavour Fellowship ( November 2012-March 2013) analysing the enforcement strategies for conflict of interest and related party transation where she was attached to the School of Law, Bond University as a Visiting Professor. 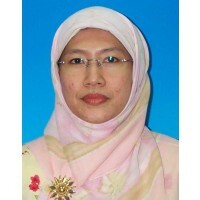 She was a recipient of the IIUM Quality Award for Reseacrh in 2008. She is a member of the Corporate Law Teachersa?? Association (CLTA) based in Australia and a member of the Society of Legal Scholars (SLS) based in the UK. She is currently a member of the Listing Committee of Bursa Malaysia (2014-present); having held the same position between 2008-2012. She is the Chairperson and Director of IIUM Corporate Management Sdn Bhd, a subsidiary of IIUM Holdings Sdn Bhd. Dr. Aiman Nariman was also a member of audit committee of the IIUM between 2010-2012 and is presently serving in the same position. 01 May 2008 Quality Award. Ahmad Ibrahim Kulliyyah of Law - University level. 01 May 2008 Quality Award. INternational Islamic University Malaysia - University level. 01 May 2003 Quality Award. Ahmad Ibrahim Kulliyyah of Laws - University level. 04 March 2003 Excellent Researcher Award. International Islamic University Malaysia - Kulliyyah level.